@Bob Wilson Jr - LOL Your list of favorites is exactly the same as mine. One of my favorite toys as a child, along with Lincoln Logs, Tinker Toys, Erector Sets, Lionel Trains, and American Bricks (which were a predecessor to Legos). I had a great deal of fun with these when I was a kid. In 1994, when our daughter was born, I did a bit of searching on the web and, to my delight, found that they were still available! 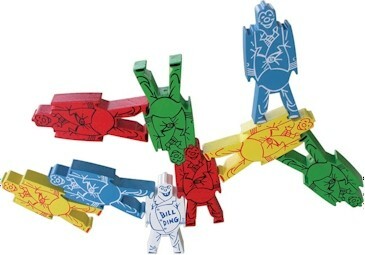 It turns out, though, that the ones I had as a kid were a smaller "Bill Ding Jr." set, and beside being smaller, they had one big (to me, anyhow) advantage; each one could stand on its head. This added to the variety of balancing patterns that could be made. I don't know why the larger version had a different head shape.